An eclectic and imaginative collection of original glass structures, weavings and sculptures by Phoenix creative, Joanne Stephens. Join Sandra Bassett & September Soul for a night of live music and open mic entertainment for our First Friday Urban Jazz Sessions. Cigars smokers are welcomed to enjoy their sticks in our Courtyard. 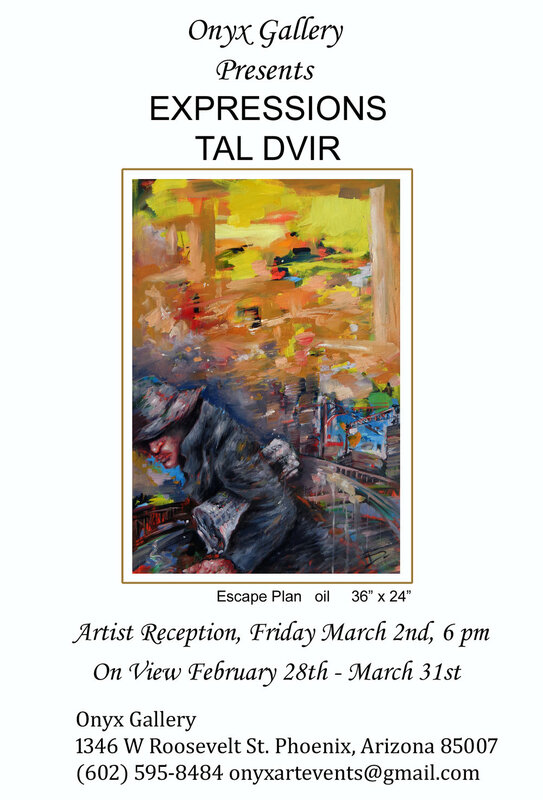 A collection of oils and watercolors by artist and college instructor, Tal Dvir. Enjoy a night of great vibes and cool people after the artwork. BYOB to the Onyx Lounge for our First Friday Urban Sessions Music Series' "All That Jazz" listening party. Citizen Fine Art Group will display their new works in an exclusive show at Onyx Gallery from November 29th thru December 6th. The pieces are the amazing art of adults with special needs who have realized and developed their talents to extraordinary heights. The artists will be on site for meet and greets on Friday, 12/1, between 4-8pm.